Do you have a child who loves to create and be social?! We will have 5 weeks of artistic journeys from sea to land and around the world. Camp is for ages 6-13 years! Take a look at some of the fun projects we have done in the past. 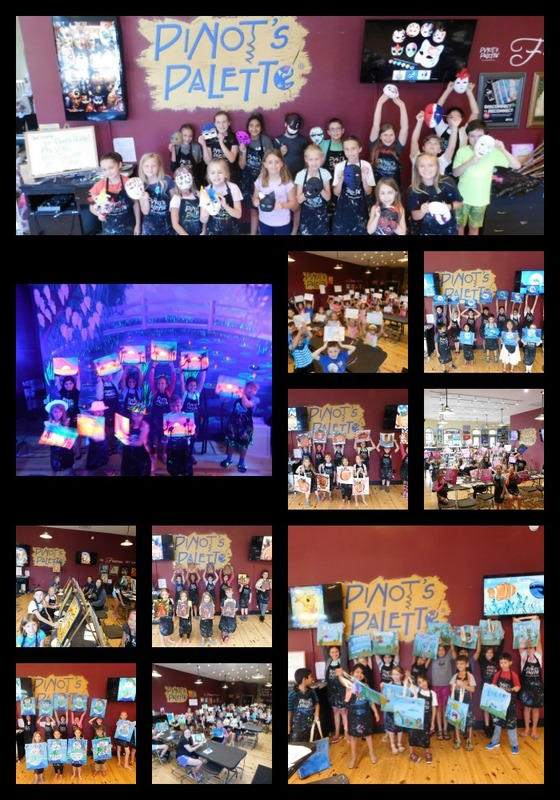 Everything from totes, painting with BLACK LIGHTS where our paintings and clothes glow in the dark, creating cool masks, canvas paintings large and small, paper projects and more! Please send a nut free snack and lunch to all classes. We will have paint, lots of paint, so please be sure to dress your young artists in paint-friendly clothing! Purchase two or more weeks at the same time and receive 15% off your 2nd class using promo code: "ArtCamp2019" when checking out! A minimum of 4 campers will be required to hold this week's camp. Should we not reach 4 you will have the option of a refund or to move to a different week of camp for camps 1-4. Sadly, after the 5th week of camp we won't host another art camp likely until winter break! You will be notified by the Friday before class is set to begin. We offer "All Ages Welcome" classes all year round. Our evening classes are 14+ and our afternoon classes are "All Ages Welcome” which will typically be on Saturday or Sunday afternoons. You will typically find age guidelines when you click on individual classes on the calendar if you want to confirm the ages for any class. For more information on private events click here!